A few weeks ago I was craving a traditional caprese salad, which is mozzarella cheese, tomatoes and basil. This fabulous trio screams summertime to me. 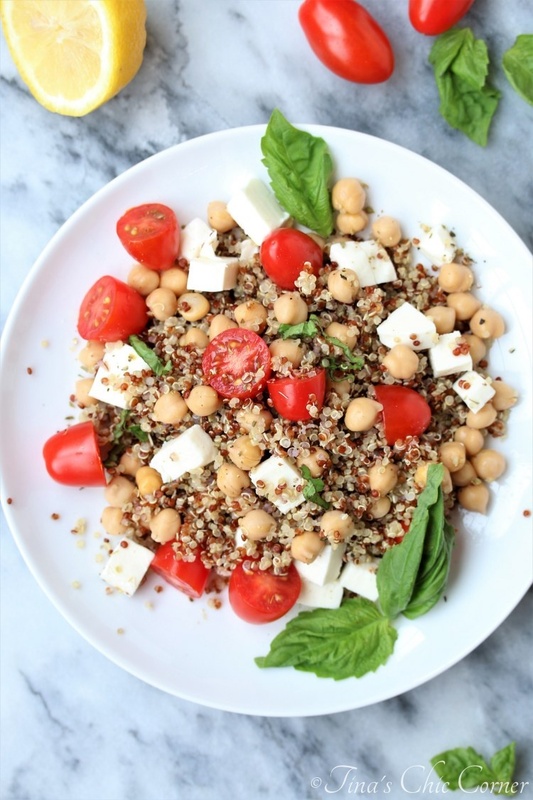 I wanted to kick it up a notch and add something hearty and protein-y, so I added quinoa and chickpeas. 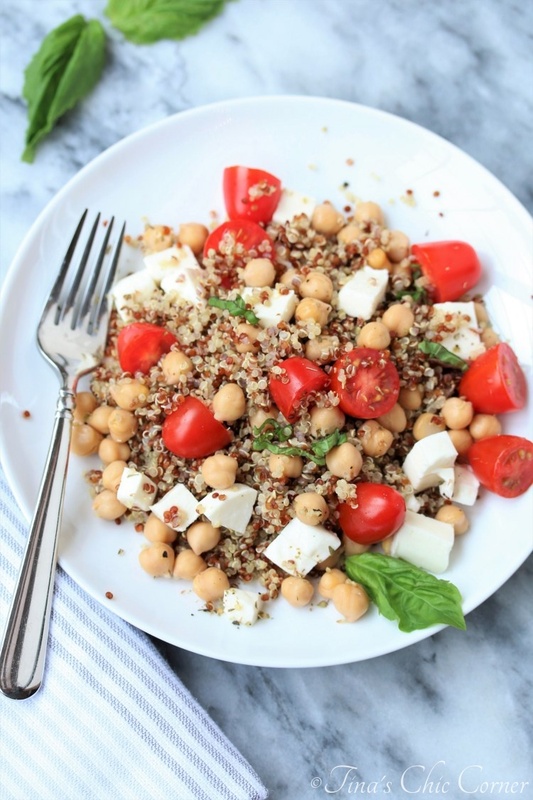 Chickpeas are the answer to everything for me. 😉 And quinoa… I’ve been adding that to almost every lunch lately. I’m sure that my husband is cringing as he reads this because he’s not a fan of quinoa. Not at all. He can even detect the smell of it cooking from the next room. You can use a variety of dressings to top this salad. Today, I shared a lemon and oil dressing which is light and just coats everything. If you like a lot of dressing then you may want to make more than what the directions call for. A balsamic vinaigrette dressing would also be a delightful option because balsamic vinegar is a great compliment to the tomato, mozzarella cheese and basil combo. I also like to use Ken’s Steak House Lite Caesar Dressing if I don’t feel like making a homemade dressing. I’ve been eating this salad like it’s going out of style so I finally decided that I had to share it with you. I’ve also enjoyed this salad with a meat twist by adding sliced deli turkey and it’s equally delightful. I’m sure grilled chicken would be a great alternative too. I usually tend to go for the vegetarian option most of the time. However, I wanted to give you options because variety is the spice of life, right? I think so, especially when it comes to lunch friendly options because I’m always on the hunt for the my new favorite make-ahead lunch. Cook the quinoa according to the directions on the package and then set it aside to cool. 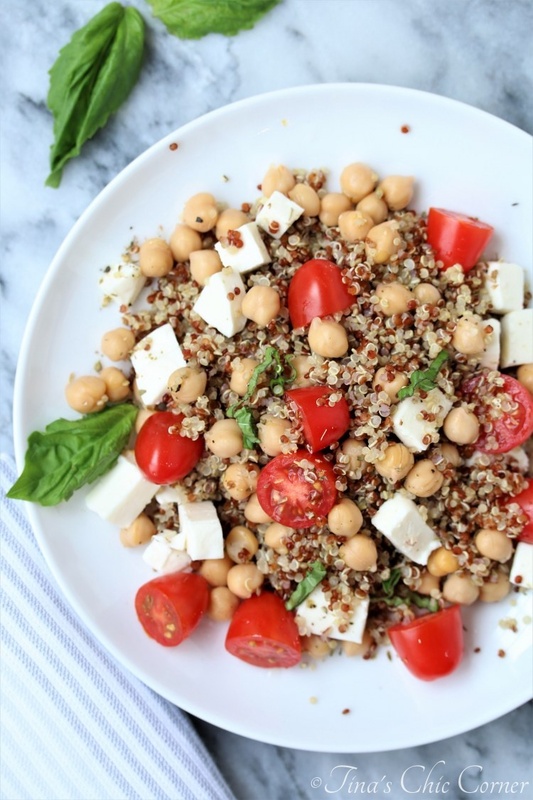 In a big bowl, add the cooked (and cooled) quinoa, chickpeas, chopped mozzarella cheese, sliced tomatoes, salt, pepper, and chopped basil, and gently mix everything together. Pour the lemon dressing on top and gently mix everything together again. In a medium bowl, whisk together the oil, lemon juice, minced garlic, pepper, salt, and oregano.